A: Just starting my new adventure in educating! Something about the start of the New Year just feels so refreshing! Another New Year, another new beginning. Each New Year brings another 365 opportunities to live the life you want! With that being said – what do you plan to do with your 365 opportunities?! Pick up a new hobby? Develop healthier lifestyle habits? Start a new career? Chances are if you’re reading this, you have some type of interest in the beauty industry. Doing makeup or hair may already even be one of your hobbies. If you haven’t thought about it already, what about making this the year you decide to pursue a career you’re actually interested in?! With the New Year just around the corner, it’s often a time when we look for opportunities to make positive changes in our lives. We’re all familiar with the tradition of making New Year’s resolutions – as we start to look forward to the New Year, we start to consider areas for improvement in our lives. Our New Year’s resolutions can vary across the board, but often times they focus on health or career-related goals. Perhaps you have career goals of your own. Have you been dreaming of a career that excites you and makes you happy to show up to work every day instead of feeling like you’re just holding a job? 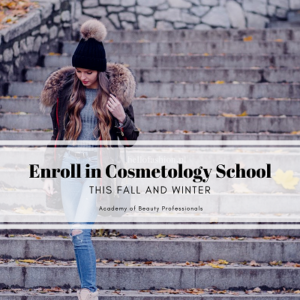 Are you thinking about finally taking the plunge to enroll in beauty school?! You chose the right time to get into this industry. We asked our mentors if they could give a future beauty school student any advice what would it be? What’s better than beauty products? More beauty products! This year we’re sharing a beauty gift guidefor all of those beauty enthusiasts out there. To make it easy on you, we’ve separated gifts by beauty interest. Whether you know a glam lover, hair lover, or skincare lover – we’ve suggested something for all! The holidays are the best time of year to score some major deals on beauty products. If you’re buying for yourself ;), or loved ones – read on to get the tea on must-have holiday products! Cold temps, low humidity, and harsh winds can take a toll on your skin during the winter months. From cozying up by the fireplace, snowy walks, or ice skating adventures – these festivities can have some harsh side effects on your skin! Fortunately, there are steps you can take to protect and replenish your skin from the brutal winter elements. To give you a head start on your winter skincare routine, we’re going to list a few tips to keep your skin healthy and happy all winter long! Cosmetology school can differ from traditional schools. Why?! Because it offers a unique learning environment. You learn in both the classroom and hand on in the performance floor. Typically if students have struggled with a traditional learning environment, like high school, they find cosmetology school to be easier. The great thing about cosmetology is it integrates both types of learning styles! To become a licensed cosmetologist the state requires you to pass the state licensing exam. Students who struggle with taking tests tend to dread the idea of taking a state exam; however, we have several tips and tools that prepare our students for the written and practical exam – no matter what your learning style is! If the idea of working with people every day in a salon or spa environment excites you, then maybe it’s time to explore career opportunities in the beauty industry. Imagine yourself working as a stylist, colorist, barber, nail technician, makeup artist, or skincare specialist…within one year or less! The sooner you enroll, the sooner you can work in a career that fulfills your passions. People love beauty products. More than that, they love learning about how to put makeup on, how to execute the perfect hairstyle, and love learning about colors and products. Chances are if you have any interest in learning about new beauty products and techniques, you actively visit beauty influencers’ social media pages – most often times their YouTube channels. The top beauty influencers on social media set the stage for beauty trends. From pro makeup artists to self-taught “DIYers,” they are truly changing the beauty game – and making our lives a bit easier by sharing their beauty reviews, tips, and tutorials! This week we’re sharing some brief info on some of the top beauty influencers of the world! If you don’t follow them already, these are influencers you should definitely check out. Self-care is a hot topic of discussion in the media – and among friends. Who doesn’t love a “treat yo-self” moment?! But what does self-care really mean? In essence, self-care is the mindful action of doing things to rejuvenate your mind, body, and soul. It ensures that you are taking care of you. Self-care can look different to every single person. It can mean taking 10 minutes out of your day to meditate, making it to the gym for an hour, or indulging in your favorite dessert! For many people, the simple act of skin, hair, and nail care is a way to practice self-care. For example, something as simple as a fresh manicure just makes you feel refreshed and put together. After all – when you look good, you feel good! Right now #self-care is trending, which means it’s really a time for the beauty industry to shine. We lead stressful lives and people are always looking for ways to relieve stress. Making a visit to the salon or spa is one (very popular) way of #self-care.